Our preschoolers engaged in recognizing and writing the letters in lowercase ‘a’ to lowercase ‘d’ and uppercase ‘A’-‘Z’ with tracing, coloring. 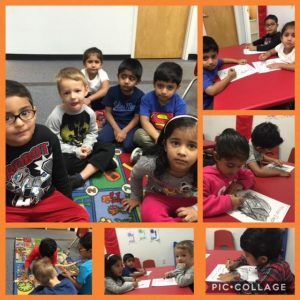 We reviewed numbers from 1-10, shapes, number matching, sensory table and other activities like puzzles to focus on coordination of fine motor skills. We reviewed words starting with lowercase letter ‘a’ to lowercase ‘d’. In January we learned about traffic signals, numbers, letters, shapes, alphabet and different types of vegetables and animals. We read stories and let kids participate through action movements dancing, singing and acting part of storytelling.